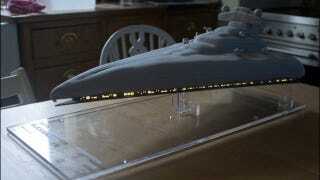 Holy Hoth, this cake version of a Star Wars Star Destroyer is glorious. Look at it, with its icing, and its gorgeous stand that makes it look like it's floating — it even lights up! This cake is too beautiful to eat. We should all just tenderly stroke the grey icing with respect and awe. It was created by Lorenzo Wood, who has a step-by-step photo collection on his Flickr page along with this video that shows how the cake lights up. Brilliant!